Vintage Mid-Century Modern Large Teak & Yellow Pendant Light, Hanging Lamp Stunning large mid century hanging pendant lamp circa 1960. Sleek, minimalist mid century modern design. 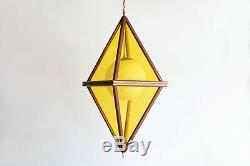 Unique diamond shape with teak wood frame and yellow-tinted acrylic panels. Beautiful interior white glass globe visible through the yellow panels. Very large size at 34 tall. Diamond frame hinges at center to open. Excellent vintage condition with wear consistent with age and use. Some surface scratches in the centers of some of the yellow acrylic panels (see pics). No visible chips, cracks, scratches to the glass globe. Original wiring in working order. A true statement piece with striking mid century style. The item "Mid Century Pendant Light Hanging Ceiling Lamp Large Teak Yellow Vintage" is in sale since Tuesday, November 29, 2016. This item is in the category "Antiques\Periods & Styles\Mid-Century Modernism". The seller is "brass_house" and is located in Dearborn, Michigan. This item can be shipped to United States.